The world’s largest LEGO online marketplace, BrickLink gets millions of views of their videos on their YouTube channel. Looking for a sharp intro for these videos, they sought us out to create a quick stop-motion animation opener that showcased their brand and instantly conveyed the excitement of one of their custom models. Take a look behind the scenes to see how we went about creating the animation. BrickLink provided us with one of their most popular and top-selling custom models, a Pegasus, which retails online for $200. 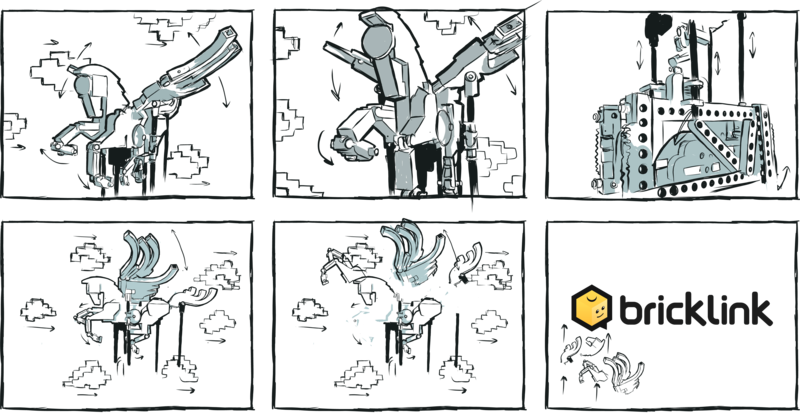 We worked with BrickLink to come up with a concept and storyboard the key frames, shown above. With intricate movements and the ability to flap its wings when its wheel is cranked, the Pegasus bobs side to side to come alive. To capture all the frames we’d need, we devised an innovative way to power the flapping wings with a drill to provide a smooth, consistent automated movement. We attempted to capture the model first in a movement-to-disassembly process. This proved difficult when trying to remove individual bricks without fully displacing the position of the model, especially in a linear 6-second sequence. The strategy was adjusted to assemble the entire model from the base up, one shot and one brick at a time. Stop-motion animation is painstaking, requiring plenty of intricate planning and patience. The set-up had to be lit perfectly with a combination of ring lighting and LEDs. We shot the scenes using a slider, dolly and other tricks of the trades, all on our green screen. To image the product in a heroic way, we broke out our top-of-the-line Nikon D850 camera with a 50mm f/1.4G Lens to capture stunningly crisp images. Our initial concept proved to be too long…it was not enough time to show everything in just 6 seconds. We had to rethink elements and show them in a cleaner environment which included a lot of experimentation, creative thinking, and trial and error. We ended up showing more disassembly and less movement to get the look and feel just right. In post, we built clouds and backgrounds, constructed the cardboard box and faked 2D LEGO elements falling to show the box closing. Thank you so much! It turned out great and we are all happy with the final result.